When the Royal Canadian Air Force deployed over Libyan skies, its pilots bedded down safe and sound in hotels in Sicily. 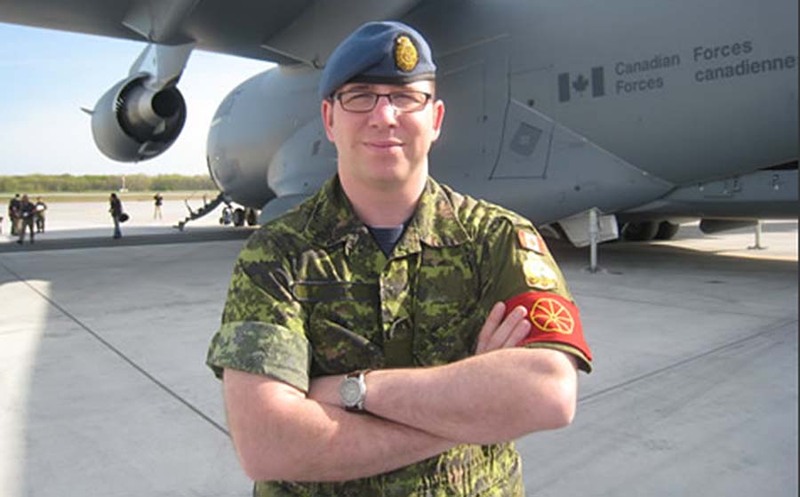 In fact, all Canadian troops there in support of the UN-backed mission in Libya were booked into hotels - an initially ad hoc solution that lasted for nearly nine months and cost taxpayers millions of dollars. CBC News has learned the Armed Forces likely spent about $11 million on hotel bills, which amounts to more than 10 per cent of the military's $103 million total cost of the mission. One spreadsheet shows $7.7 million for accommodations for a few hundred troops in two or three locations on the island of Sicily. NDP Defence critic Jack Harris says that's a hefty price. "It was a temporary mission, and as a result you are going to get a temporary cost," he said. "But our understanding was - and the Canadian public was led to believe - that they had all the co-operation of the government of Italy, and the use of their base to run operations out of." Even though the military had secured access to an air base near Trapani, Sicily, it was unable to get military accommodations there. It spent considerable effort looking at whether and where it could build a temporary base for Canadian troops. It also solicited cruise ship owners who might be prepared to lease a vessel to act as a floating camp. Military planning documents obtained by CBC News show the military knew that option would be expensive especially if the mission carried on for more than just a couple of months, as it did. But officials worried about the optics of the air force waging a war over Libya while bedding down on a cruise ship off Sicily. A ship might make sense, one official wrote, "but we need to survive the Globe and Mail test." In the end, the military decided not to rent a ship or build a camp, but to rent hotel rooms. In May, the military said it had spent more than $30 million on food, transportation and accommodations for the mission. In September, the military said it was unable to confirm the CBC's figures. Spokesman Daniel Blouin said the military was still working to break down the figures. But, Blouin says, all those costs were incurred in an effort to free the people of Libya from the regime of former dictator Col. Moammar Gadhafi. Interesting Article on Sqn Ldr Spiers. My late father met him in 1982 at HMS Drake, during Op Corporate. Sqn Ldr Spiers was detached to Plymouth during the build planning stages and was accommodated in the Wardroom (officers Mess to us RAF types) at HMS Drake. As he stood out in RAF uniform my father (who was working in the Bar) asked who he was and how he could help during his stay. 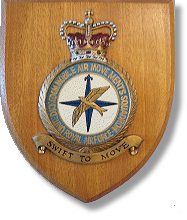 During the chat S/L Spiers said he was in the Movs trade so Dad said that I was too... doubt he remembered me as a student on the RAFMS but they had a good natter about the trade... oddly my Dad was Army during his military career..but now working in the Naval Wardroom. A roaring three-plane flypast helped celebrate the golden anniversary of one of Oxfordshire’s most iconic aircraft. It was the centrepiece of celebrations at RAF Brize Norton on 28th August marking the 50th birthday of the VC10. But the impressive tribute could prove to be its swansong, with the eight remaining aircraft due for decommissioning next year. 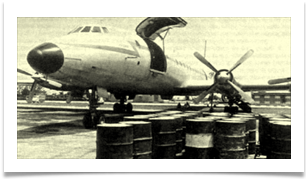 The VC10s, which are based at RAF Brize Norton, started life as transporter planes, but are now used to refuel other aircraft in flight. At its peak, the RAF had 27 VC10s and the plane has flown in conflicts from the Falklands and the Gulf Wars to last year’s Libya crisis. 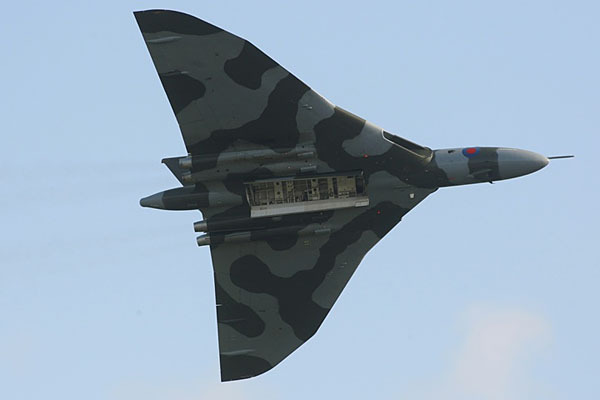 In 2013 they will be replaced with Voyagers, which will also be based at RAF Brize Norton. 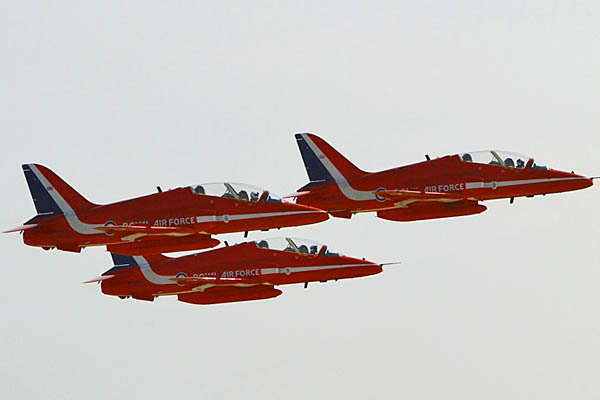 The three planes flew in formation up to Scotland and back to complete a refuelling exercise. 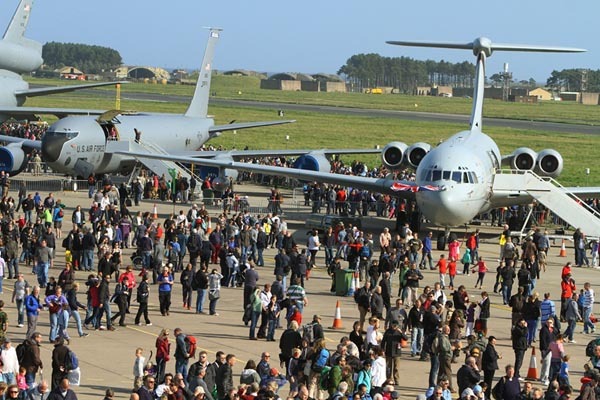 Royal British Legion Oxfordshire vice-chairman Mike Henderson, who worked on VC10s at RAF Brize Norton in the 1970s, said: “VC10s are without a shadow of a doubt Oxfordshire’s most iconic aircraft. The photos on Tony's latest brief of the Tower at Darwin. The shot of the RAF Comet 2 XK696 is the beautiful "angel" that took me home in Jan '57 from that dump Aden after nearly two and a half years in the Middle East. There were some happy days! Some of the more derelict buildings at the base are set to be removed before a planning application for the new defence technical training centre is submitted next spring or summer. A spokesman for the Ministry of Defence said: “To streamline the construction period it is possible some advance works will be undertaken at the site. This could include the demolition of some of the most derelict buildings or site infrastructure works. It is envisaged that these could commence later this year and continue into spring 2013. We will provide further details on these works when available." Demolition work at RAF Lyneham could start before the end of the year. At present, colleges and training centres across the country teach personnel from all three military services. Up to 25,000 students a year could be housed at the defence technical training centre, which would be fully established by 2020, with 1,950 students and staff there by 2015, rising to 4,300 when training is established. 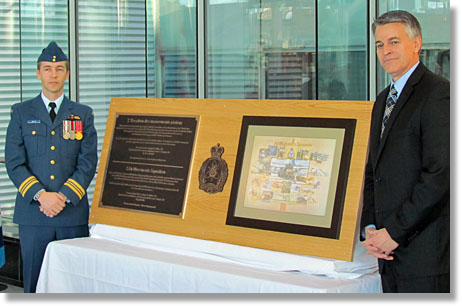 Major Ken Mills and Mr. Pierre-Paul Pharand, President Airport Operations and Air Services Development Montreal-Trudeau Airport stand beside the plaque commemorating the establishment of 2 Air Movements Unit at Lachine, Quebec. 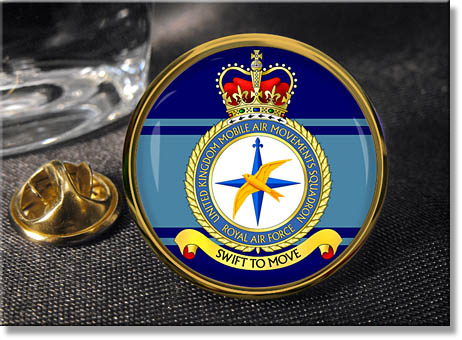 2 Air Movements Squadron celebrated their 60th Anniversary on 1 April, 2011 and issued commemorative coins for this event. I attended the 50th and 60th anniversary celebrations which were held in Trenton. 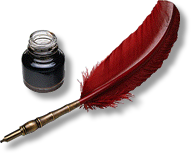 I am glad to see your newsletter is up and running again! Australia is open to providing Indonesia more Lockheed Martin C-130H tactical transports, following its gift of four examples announced in July. He was responding to a journalist's query regarding unsourced news reports that Australia is on the verge of selling six C-130H aircraft to Indonesia for $15 million each. Smith said that six was the number of aircraft Australia could "probably" offer. In early August, the Jakarta Post quoted an Indonesian defence ministry spokesman as saying that a deal was in the works for six Royal Australian Air Force (RAAF) C-130Hs that will be retired at the end of 2012. On 4 July 2012, Australia and Indonesia signed a memorandum of understanding for the transfer of four surplus C-130Hs to Indonesia. Jakarta is to fund the refurbishment ofthe four aircraft, which have been parked since 2009. On 9 May 2012, Canberra announced that it will retire the RAAF's C-130H fleet early, in hopes of saving A$250 million ($260 million) over the next four years. The type's missions are to be farmed out to other types such as the C-130J and the Boeing C-17. Australia operates 12 C-130Js and five C-17s, with a sixth example of the Boeing type on order. 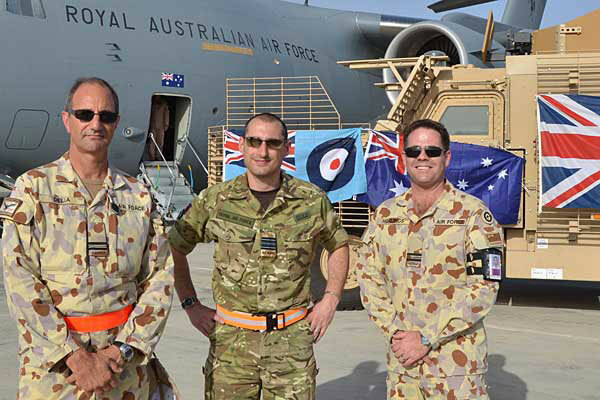 I have some photos while I was OIC Air Load Team last year in the Middle East; the RAAF helped out the UKMAMS boys! 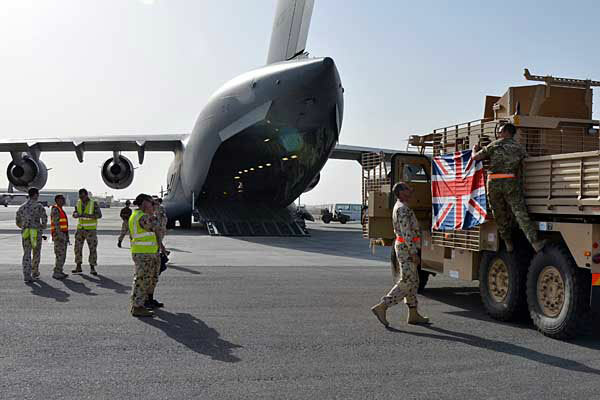 We transported two Wolfhounds and a Recovery vehicle in our C17s to Al Minhad Air Base in Afghanistan as the UK C17s were retasked for Libya emergencies, etc. 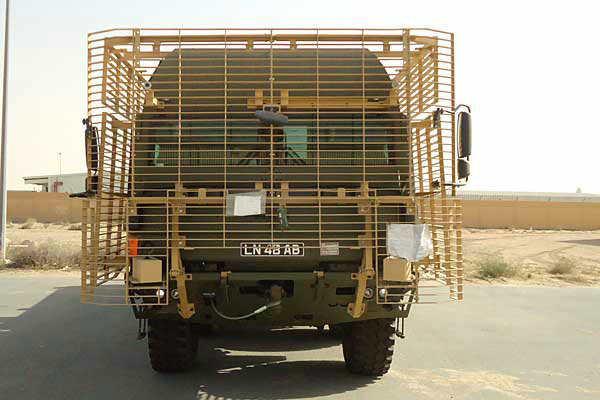 We had to request clearance from the RAAF engineers back in Aus, load plan, loading and lashing and finally approved. 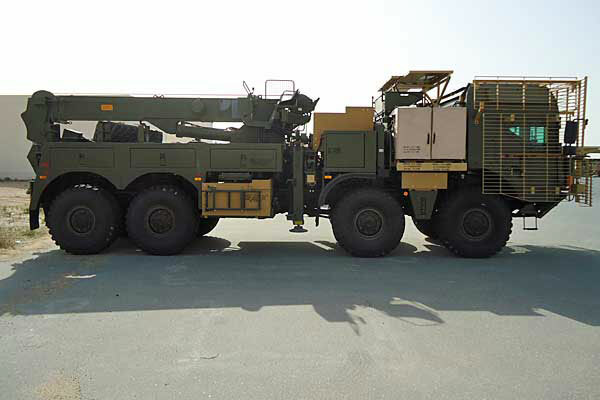 The footnote to this is that although I provided the original Load Plan used by the UKMAMS to transport the vehicles to UAE, the load and lash 'pinky' etc., they still had to come up with their own calcs. It didn't balance using the Aussie plan. 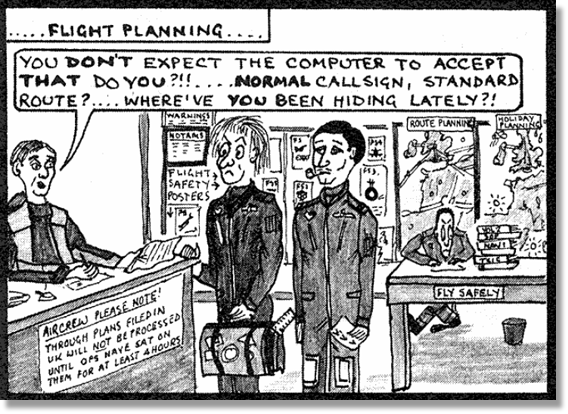 They finally agreed to use the original RAF load plans and it was all eventually flown to Afghanistan for the Brits there. 302 Entry, (RAF Hereford Jan - Dec 1965), had a reunion at the RAF Museum Cosford and then Stafford for the night of 25/26th April this year. 14 of us made the effort although I was the only mover and Mick Jones ex-ALM. There are other Movers but all FTR'd. I believe Tony Saw has a good reason as rumour has it he has cancer! 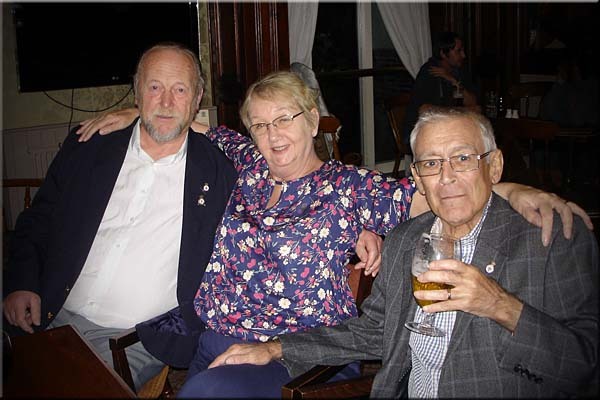 Others couldn't make it because of distance; John Tudor, Ken Hall, Lionel Earndon and Brian Gibson, although the latter lives in Stafford! During the build up to the event I was saddened to learn that my good mate Keith Sharpe was dead. After more investigation it transpired he passed away last June after complications during a stomach operation. I was also amazed to discover he had become the Lord Mayor of Leith in Lincolnshire. This was our 45th Anniversary reunion and so obviously a 50th one is being planned. "I've indicated to [Indonesia's defence minister] that if Indonesia is interested in acquiring more C-130s, then we have some which we will be able to sell," minister for defence Stephen Smith said in a media briefing. 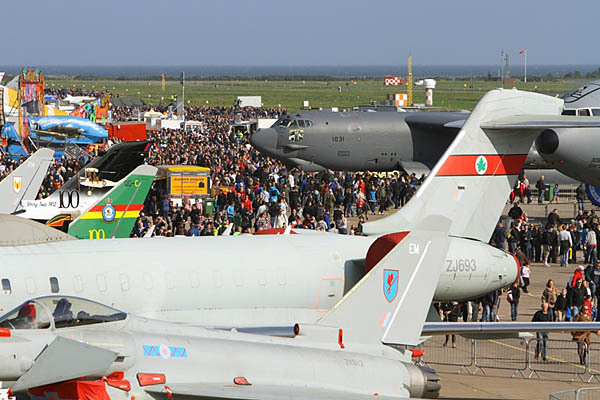 Sparkling weather put a shine on the RAF Leuchars Diamond Jubilee Airshow on Saturday as more than 40,000 people descended on the Fife air base for a fantastic day of flying and a celebration of the armed forces during the Queen's 60-year reign. History was made early in the day when Number 1 (Fighter) Squadron, one of the oldest squadrons in the RAF, was returned to active service. 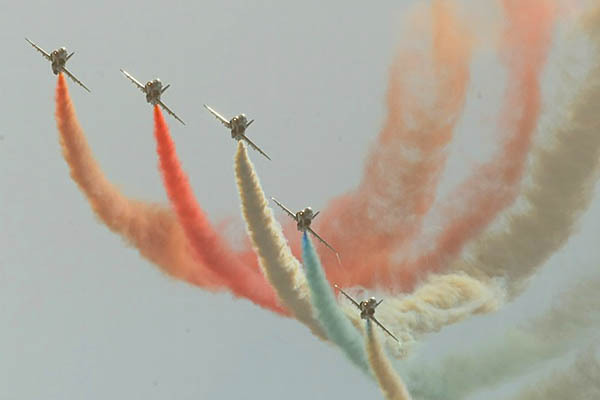 The occasion was marked by an impressive parade and flypast. 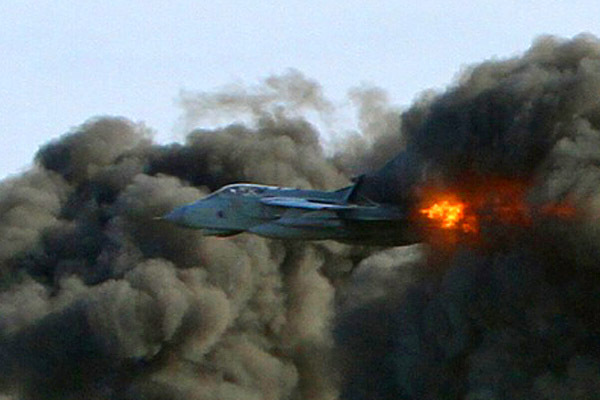 The squadron was disbanded in January 2011 with the retirement from service of the venerable Harrier. 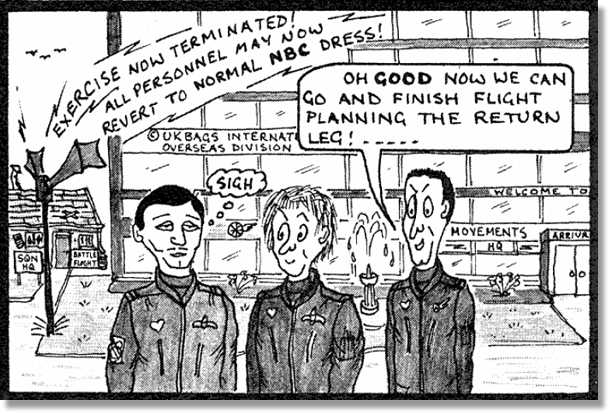 Now, however, the new 1 (F) Squadron has joined its sister unit — 6 Squadron — as the second Typhoon unit at Leuchars. There are now four Typhoon frontline squadrons in the RAF. Numbers 3 (F) and XI Squadrons are based at RAF Coningsby in Lincolnshire. Ultimately, the Typhoon force will grow to five frontline squadrons. 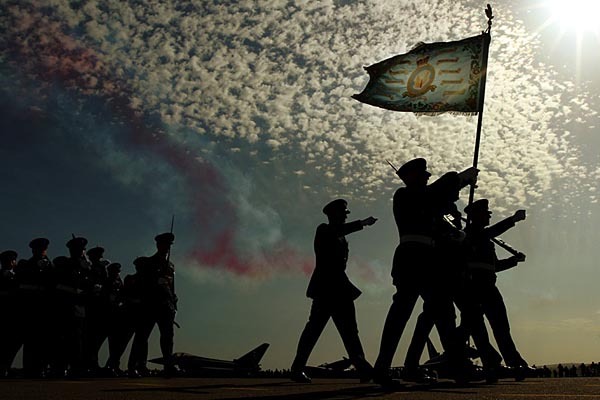 During the parade, watched by VIPs including Scottish Secretary Michael Moore, North-East Fife MP Sir Menzies Campbell and Fife Provost Jim Leishman, the RAF chaplain-in-chief consecrated a new squadron standard. 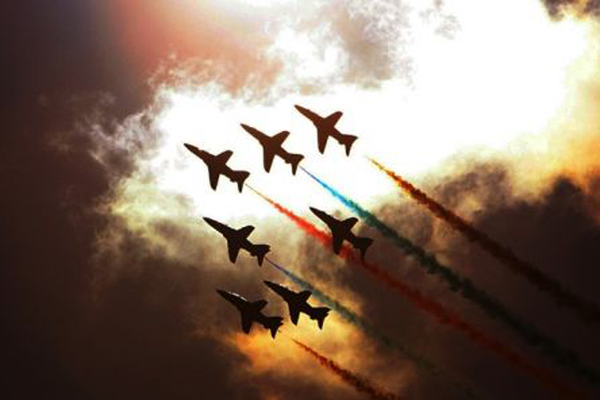 There followed three dramatic flypasts recognising the squadron's proud history and new role. 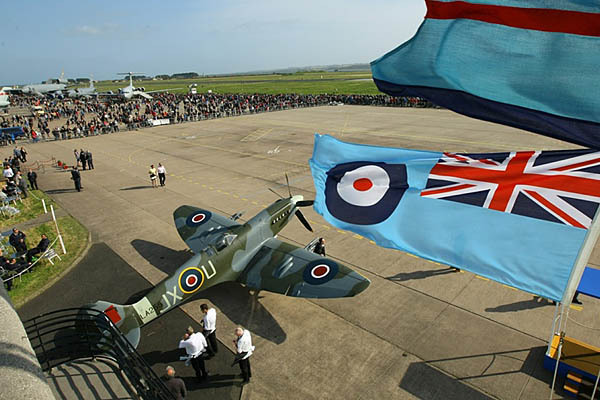 First came a Hurricane and Spitfire from the Battle of Britain Memorial Flight. Both aircraft types were flown by 1 (F) Squadron pilots during the second world war. 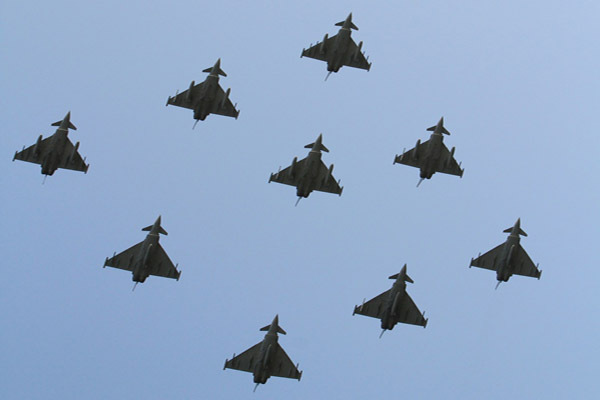 Then came a four-ship formation of Typhoons, flown by pilots from both 1 (F) and 6 Squadrons. Finally, the Red Arrows paid the squadron their own tribute, flying past the parade in 'big battle' formation while trailing the squadron colours of red and white as they arrived at the show. Chief of the Air Staff Air Chief Marshal Sir Stephen Dalton was the reviewing officer for the stand-up parade. Describing the RAF as the ''best of the best'', he said: ''It is great to see such a distinguished squadron back in active service equipped with the combat-proven Typhoon. ''Our Typhoon force will continue to grow, ultimately to five squadrons, and when combined with the Tornado force, and in due course with our Lightning II force, the RAF will be well-placed to face the challenges of the future. 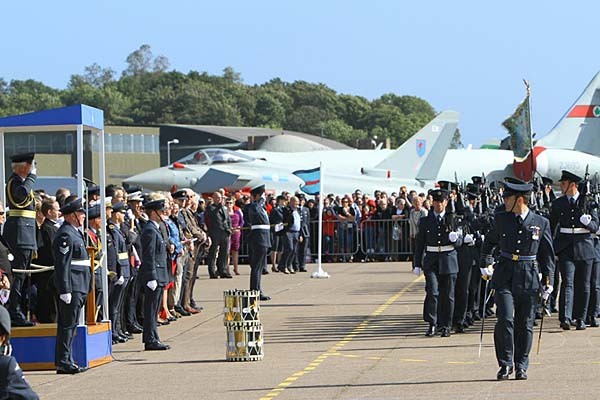 ''As always when I visit the RAF Leuchars Airshow I am heartened by the very real depth of support that the people of Scotland have for the RAF, for which I am most grateful." 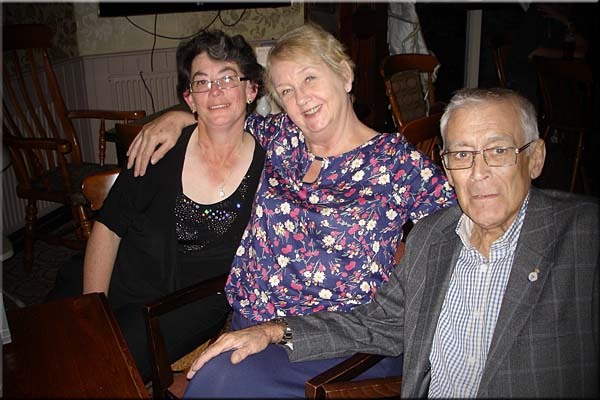 Here's three pictures of Phil (Nobby) and Margaret Clarke along with my wife Darrelle and me. We managed to get together for dinner at a local hostelry when they came over from Vienna to visit with family recently. A grand time was had by all! 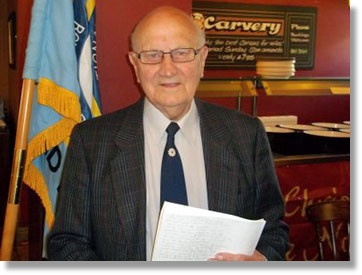 Our speaker this month was a really great, 90 years old, Max Daetwyler who gave us a brilliant talk on his RAF service. During the Battle of Britain he was stationed at Hornchurch as an engine fitter on Spitfires and then in 1943, when the Germans were easing up a bit on their raids, he was posted to 242 Canadian Squadron led by Douglas Bader working on the Hurricanes that were carrying out daily raids on the enemy in France. One day he was called to SHQ to be told that he had a new posting and it was to a engineering company called Power Jets at Lutterworth. He couldn't really understand this, however he soon found out. He was met at the railway station and driven to the factory sat in the back of a posh chauffeur-driven limousine. 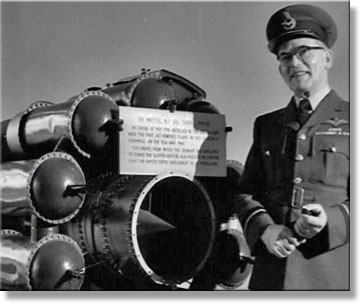 Here he was to work with the development team on jet engines and the man in charge of course was Frank Whittle. 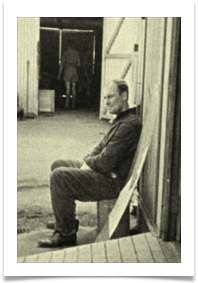 He was here until the end of the war when they were moved to Germany to the BMW factory near Munich. This was where the German jet engines were built for the ME262 and everything was in pristine condition. Working with American service engineers who were very suspicious of them as he and the other RAF lads were still in RAF blue which was very similar to the Luftwaffe blue but as soon as they got to know them it was ok. The factory, test beds and living conditions were untouched by the war and working with the US engineers was A1. Eventually all the contents were moved to the USA for further development and Max returned to the UK for demob. He spent the rest of his working life in the developing world of jet engines mainly at Rolls Royce. Great to make contact with you again. I used to get the MAMS OBA newsletter and then it all stopped! I'm still alive and kicking. 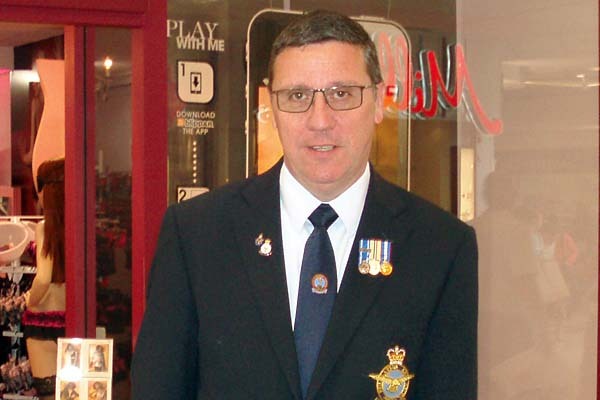 I retired from the RAF in 2002 after 39 years and went into local government working in Environmental Health. I retired from that in July 2011 and now spend my time helping my wife Gill run her fashion shop here in Wantage which we have had for the past nine years. Hope you are keeping well. 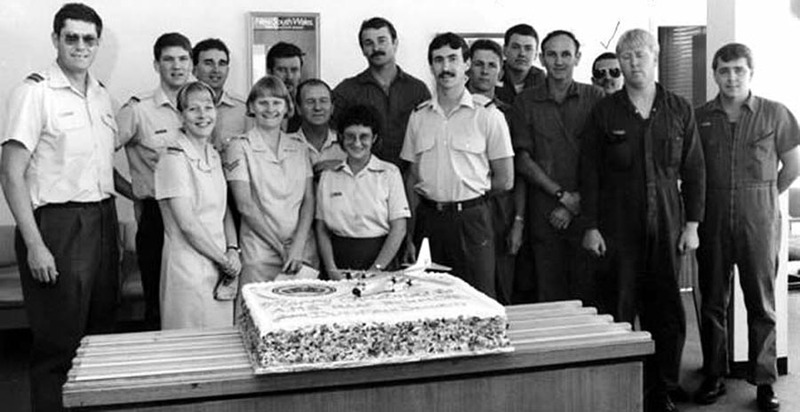 It will be 50 years on 25th September that we all started our careers! Would be good to have another reunion. Pass my best wishes to any who still remember me. Look forward to hearing from you again soon. 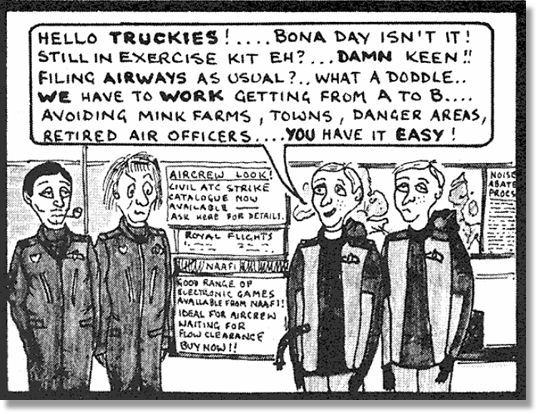 I entered the RAF on 16th September 1958 as an aircraft apprentice in the 90th Entry of "Trenchard Brats"
Well last Sunday, 16th September, a small contingent of us met in the Bat & Ball pub at Farnham, Surrey. This was to coincide with the same happening all over the world where 90th Entry brats now reside. 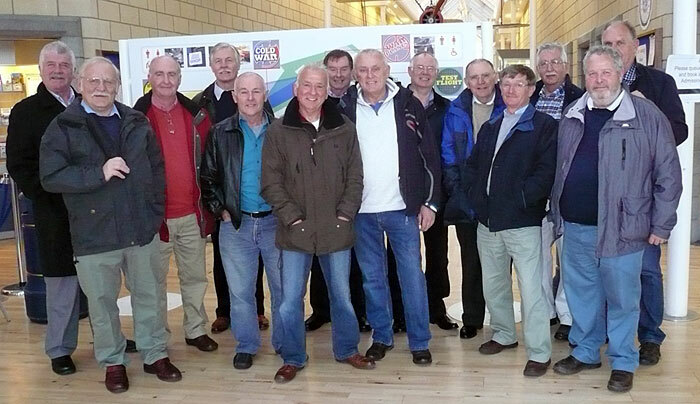 54 years have passed since enlistment and some of us have not seen each other since those days. As the picture shows we all had a good time reminiscing. So enjoying catching up with the news via the OBB. I've read them all the way back - lots of well known names there. Thanks a lot! I have just started out to record what will be a longish piece on my time on Station Movs, Khormaksar in 1967, but in the meantime I wonder if any OBs out there remember Flt Lt Harry Lawson, a DAMO at Lyneham, 1965/6 time? 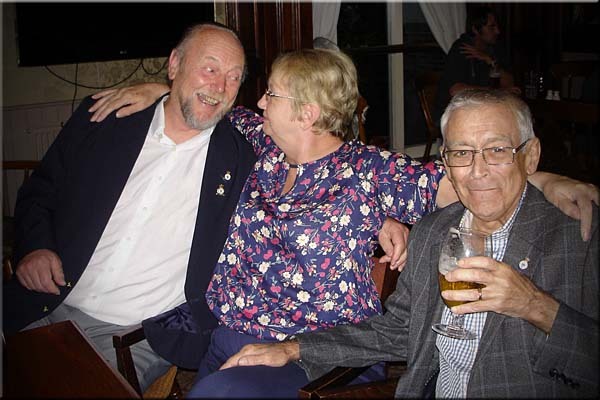 Harry, who hailed from Kirkcaldy, had been a Major in the Music Corps before becoming a Mover, was a great guy, taught me a lot about classical music, and was a great practical joker. On one occasion he 'loaded' our WRAF Traffic Officer's handbag with condoms, so that when she generously bought her post-shift round of beers, they scattered on the bar top! 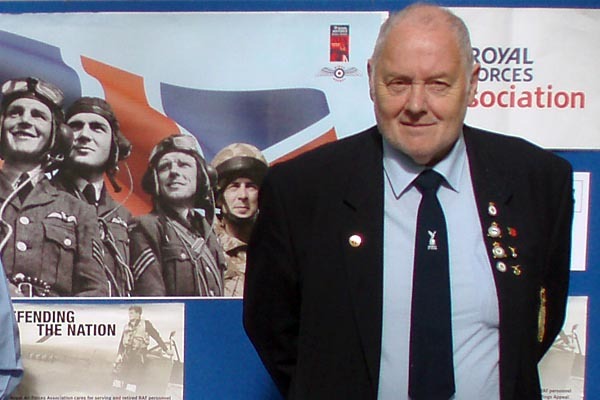 I also worked with DAMO Flt Lt Pete Boggis DFC, who in WW2, flew XV Sqn Stirlings. Pete was delightfully absent-minded - he told me he'd been into a pub at the weekend and the Landlord greeted him warmly. "Yes" replied Pete, somewhat puzzled. "Officer, are we, Sir?" says Landlord. "Indeed" says Pete, 'but how on earth did you know? "You're wearing an SD cap with your civvies!" chortles the Landlord. Mr. Chris Alexander, Parliamentary Secretary to the Minister of National Defence, joined the men and women of 426 Transport Training Squadron (known as the Thunderbirds) today in dedicating the new Air Mobility Training Centre (AMTC) in honour of former Wing Commander (WComd) Sedley S. Blanchard. 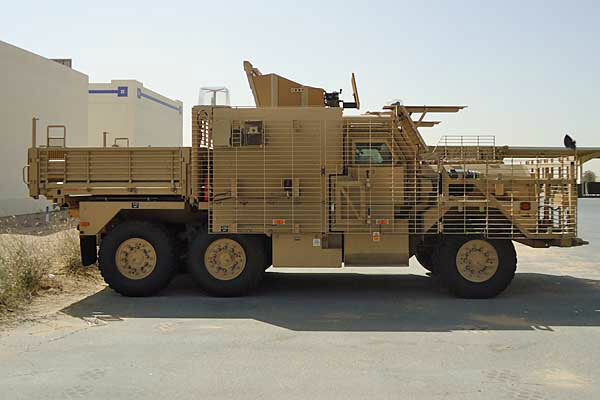 With a construction cost of approximately $40.5 million, the 17,000-square metre AMTC houses cutting-edge training equipment provided by CAE Inc., a Canadian manufacturer of simulator, modelling and integrated training technologies, and its subcontractors. The Thunderbirds conduct between 80 to 125 training serials of 25 different courses every year to generate operationally-effective air mobility aircrew and technicians in support of Canadian Forces operations. The squadron also has dedicated personnel assigned to provide operational test and evaluation and system support to air mobility fleets. 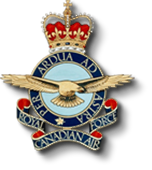 The squadron trains approximately 420 RCAF personnel annually. I have info'd Jim Hood ex 45th Supplier/ mover / trim sheet expert. Jim eventually changed trades to Dental Technician. Just thought Jim may have a story he can tell from his Air Movement days? As much as I would like to contribute, my memory from my movement days has now gone blank, other than manoeuvring suit cases into small areas within the belly holds of Viscounts and BAC 111's, one of the disadvantages of being small in stature, I was the one in the hold laying on my back using my boots to gain advantage of very little space. 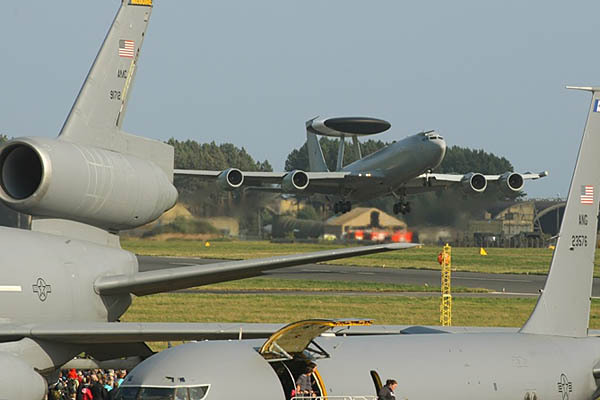 Christchurch will receive a symbolic aerial salute this Friday, as the United States Air Force makes a spectacular arrival in the city to mark the opening of the 2012/13 Antarctic Season. The afternoon of Friday 28 September will run with military precision: arriving over the Pacific from Hawaii’s Hickam Air Force Base, the US Air Force C-17 Globemaster will bank in over New Brighton Pier at approximately 1.05pm, weather permitting. With a flight path that includes Chisnallwood Intermediate School, the C-17 will then make its way across the city at an altitude of 1300 feet. At approximately 1.15pm, over the NZ IceFest site in Hagley Park, personnel on board the C-17 will photograph the word “ICEFEST” on the ground below, as spelled out by a formation of visiting schoolchildren. On Monday 1 October, the C-17 will transport Scott Base and McMurdo Station personnel south to Antarctica, enabling scientific work to begin over the summer – the “Antarctic Season”. Christchurch International Airport hosts up to 100 such departures each season. 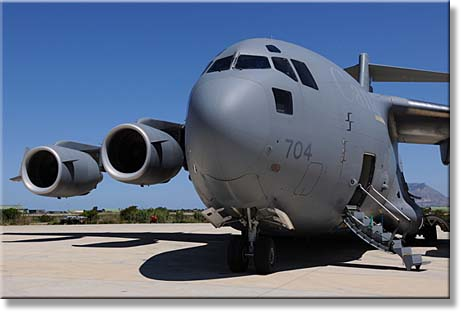 The public will have the opportunity to explore the C-17 itself, and other Antarctic aircraft, before they journey south: the Antarctic Air Day will run at Christchurch International Airport on Saturday 29 September from 11am–4pm. Visitors will be guided inside the aircraft by United States and Royal New Zealand Air Force personnel, and entertained by musicians Don McGlashan and Bond Street Bridge. The season opening concludes with the annual South to Antarctica Church Service at 11am on Sunday 30 September. The event will be led by the Venerable Lynda Patterson, Acting Dean of ChristChurch Cathedral, in Christ’s College Chapel, followed by a wreath-laying at Captain Scott’s statue in the NZ IceFest site at Hagley Park. The gesture will honour and acknowledge Antarctic science and its supporters, as well as the memory of Scott and others who have lost their lives in Antarctica. Thanks for the latest interesting issue, most informative. 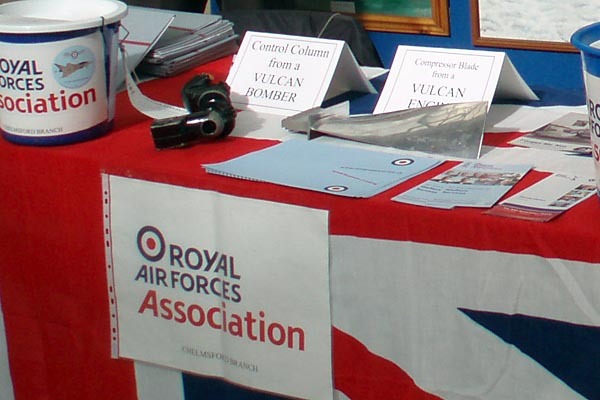 'Fraid this is where as a civvy since 1969 my topics regarding the adventurous careers in the Royal Air Force dry up. 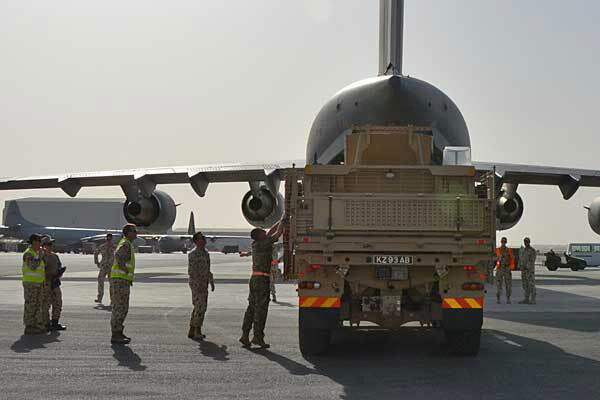 However I am concerned that the powers to be want to replace the Hercules which has been dear to my heart since I saw the first of its type at Seletar around 1962; the aircraft being a nice shiny RNZAF type and then to briefly load/unload the RAF version at Muharraq during and after the Aden withdrawal. Unfortunately I only flew in the Hercules near the conclusion of my time as an airman, from Skydstrup in Denmark to good old Lyneham. Regarding my first sighting of the RNZAF Hercules, at the time we were doing something to a Beverley at West Camp Seletar and seeing the four dark exhaust trails on approach out over the Malacca Straights did cause a bit of a panic as not too long before a Boeing 707 inbound to Paya Lebar put down at Seletar, the exhaust trails being similar on both aircraft. 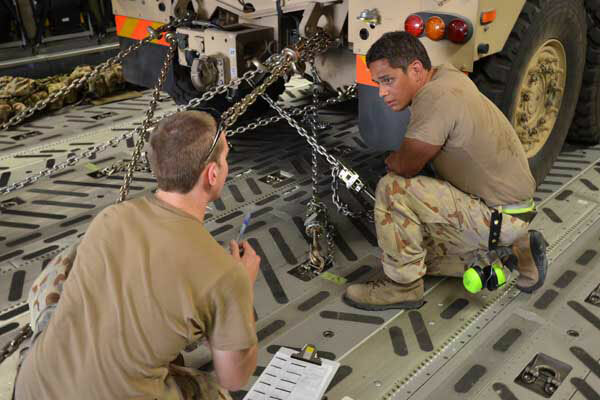 Delighted to come across this amazing aircraft and to have spent a few months working as a mover on the "Herc" Realise the alternate aircraft is a political thing and is designed to create jobs in the UK, but is there anything as versatile as what the RAF has? Three airline pilots have made history by winning their RAF wings. Today's ceremony is thought to be the first time that reservists with no air force history have been welcomed into the service as pilots. All three are experts in the Voyager - the aircraft that is replacing the Tristar. Part trooper and part air to air refueller the voyager is based on a converted civilian airliner, the Airbus A330. 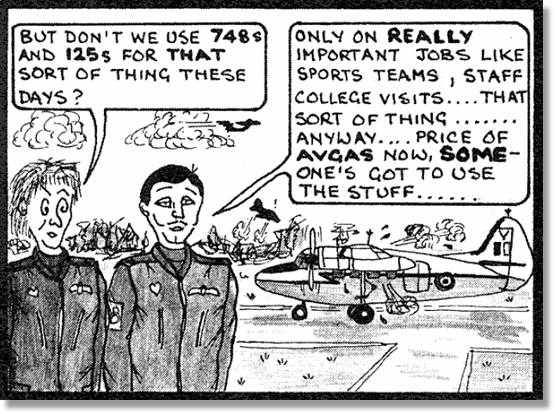 The planes are privately owned and leased to defence but flown by RAF pilots. So far just one Voyager in a planned fleet of 14 has been delivered to RAF Brize Norton. The next is expected by Christmas, with a further six by the end of next year. Here are a couple of pictures that you might wish to use. The BOAC aircraft was I believe one way of getting to Christmas Island for the H-Bomb tests in the 1950's. 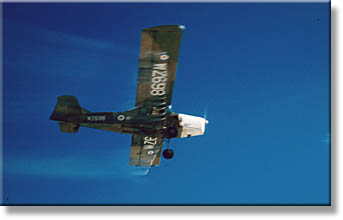 The one of the Auster was actually taken on Christmas Island by a cycling friend of mine. It can be seen spraying DDT over the island to keep down the 'mossies'. As you may remember my Father used to fly the aircraft on such sorties, hence why he had the name 'Flit' Clayton ("Flit" was an old fly spray way back then). 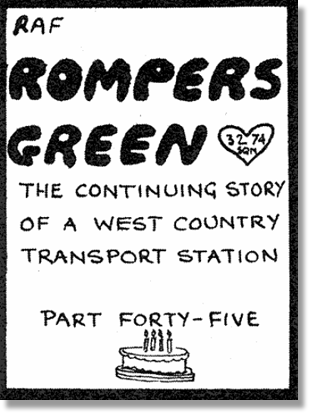 I could not make the last meet & greet in Swindon, so no photos from there this time, not sure how many turned up but I know that Keith Simmonds was hoping to make it, a fair journey for him I believe. Cheers for now and good to see the newsletter going again. 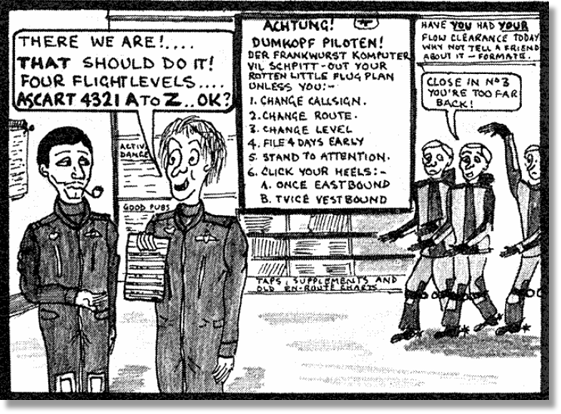 Early in my career, in the late ‘50s, I was a "Bin-Rat," (Supply Tech) at RCAF Station, Claresholm, Alberta. A loathsome job and the reason for my remuster. I was working in Tech Stores and one of my duties was issuing and returning tool kits. 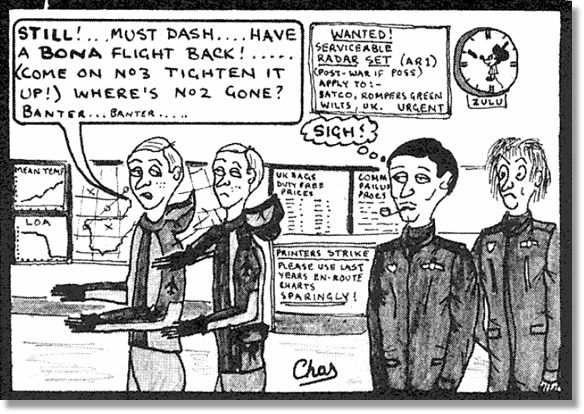 I remember one crusty old Flight Sergeant, an aircraft rigger by trade (Sgt Shatterproof comes to mind), who was retiring after 35 years service and was turning in his tool kit. He had all of it, in good condition and had no trouble parting with any of it, 'till we got to, as I checked it off his inventory, "Forks, Tuning, Set of 8, c/w Mallet. He handed me a small leather box that had a deep patina gained from years of use. I opened it to see, set in velvet, a set of tuning forks and a small hammer. He looked at me, a pimply faced Aircraftsman 1st Class, and asked, "Son, is there anyway you could see it clear to let me keep these? I was issued them on day one and have tuned the rigging on many types of aircraft all over the world and over many years." It didn’t take much thought to tell him he could keep them as I didn’t see a need for any tuning forks in the future of the RCAF. After all this was the ‘50s. That Friday at Beer Call in the Wets, I went to the bar an ordered a 50 cent beer. On putting my money down, I was told that I had $5.00 worth of credit, compliments of the old Flight Sergeant! This was a welcome surprise, and a supplement to my $75.00 (and all I could eat), monthly pay package. The RAAF’s 37SQN will hold a farewell bash for the C-130H Hercules as the airlifter goes into retirement after 34 years of Australian service. A reunion for past and present members of the C-130H community will be held at RAAF Base Richmond on November 24, just ahead of the aircraft’s retirement in December. The C-130H entered RAAF service in 1978, replacing the C-130A. 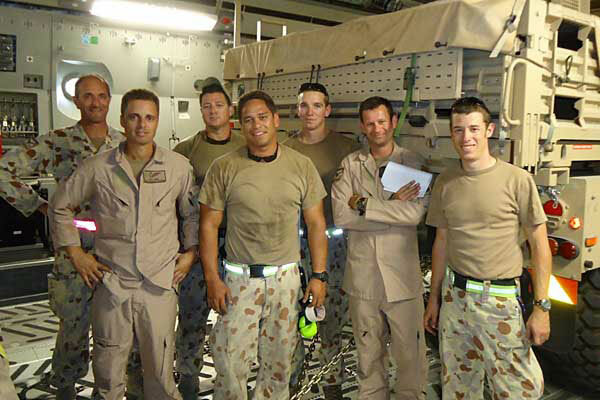 In the years since, they have supported Australian deployments in Iraq and Afghanistan, flown to Antarctica, evacuated Australians from Cambodia, and taken part in many humanitarian and disaster relief missions. “The C-130H introduced many of the tactical airlift roles which the wider Australian Defence Force now count on,” FLTLT Nelson said. Defence announced plans to move up retirement of its final eight C-130H aircraft as part of cost-cutting efforts under this year’s budget, but in turn Australia has also ordered smaller C-27J tactical airlifters, which will take over some of the roles that had been performed by the C-130H. Australia earlier this year donated four C-130H aircraft to Indonesia and is talks to sell Indonesia six more of the planes for a reported US$15 million each. I was lucky enough to be with 617 Sqn in October 1959, when we flew into RNZAF Ohakea to provide a Vulcan display at the ceremonial opening of Rognatai, the new Wellington International airport. 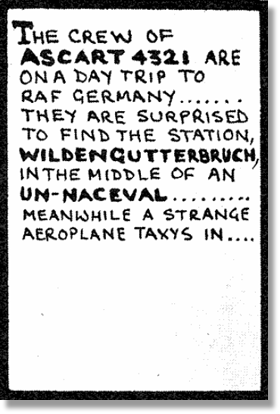 I was the trip Mover /Supplier, plus temporary Sqn Adj and was sent down to Wellington with spare wheels, brake units etc., and some ground crew, for the anticipated landing. Unfortunately, the formal opening display was delayed by one day due to bad weather, but it was decided to proceed the following day. One RNZAF Sunderland, Reg' No' unknown, managed to rub its keel along the runway during a low pass and I believe, managed to land and beach itself at Phennuapi (Auckland), sometime later. Our Vulcan, XH498 made 3 approaches (touch and go only because of the wind shear), but was authorised to make a final attempt to land. 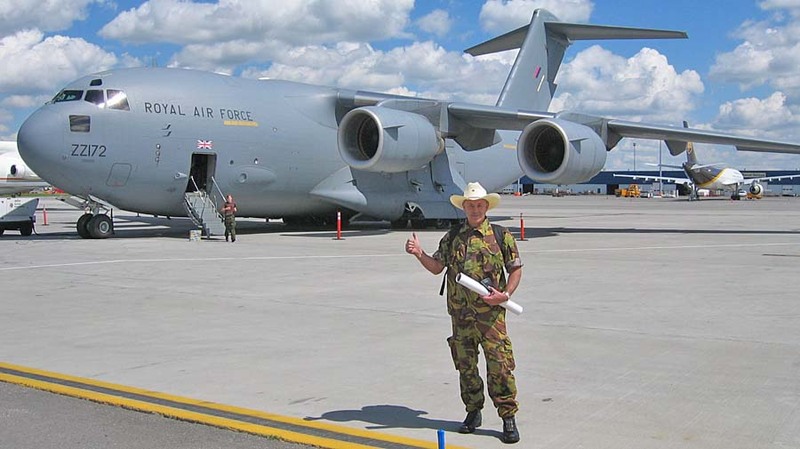 The port gear hit the threshold and broke, the port wing dragged along the runway, but Tony Smales, the Captain, was able to drag it off the runway and eventually landed back at RNZAF Ohakea, although with one leg "missing" swung off the runway onto the grass. Happily, no crew members were injured. 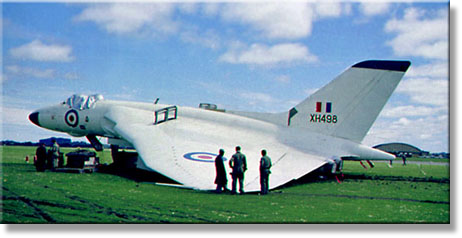 I was destined to be left behind as OC RAF Det' RNZAF Ohakea, and after recovery from the airfield, handed 498 over to AVRO for repair. 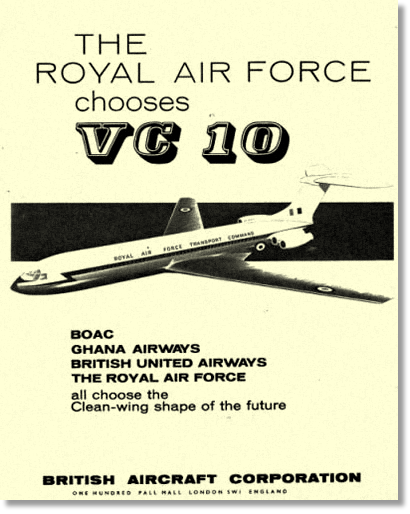 Having arrived on 19 October 1959 and eventually handing everything over to AVRO, I departed 4 December on RNZAF Bristol Freighter (5907) to Phenuapi (Auckland) and then, via RNZAF Hastings (5801) back to RAF Changi (Singapore) and eventually arrived in the UK on 21 December. 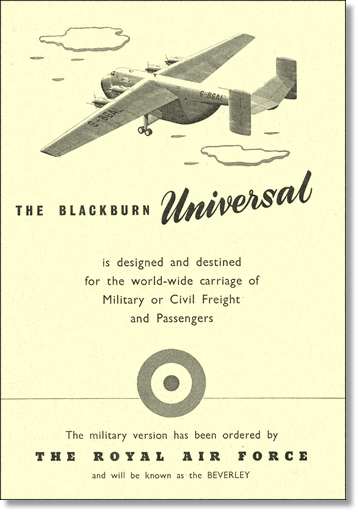 Curious to know the ultimate future of the Bristol "Frightener" and the RNZAF Hastings. 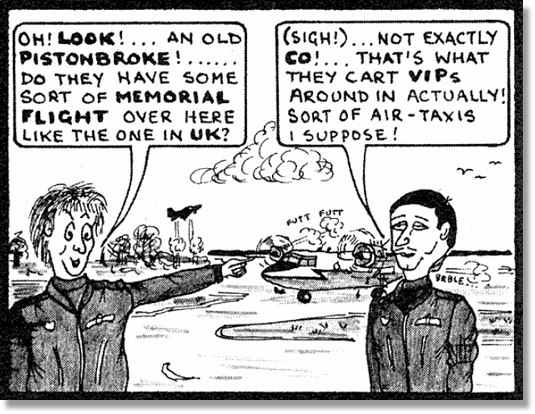 I returned to Ohakea in I think May the following year (1960) via Hastings from Scampton, 74+ flying hours. I accepted XH498 back from AVRO and prepared it for air test and eventual return to Scampton a couple of weeks later. Wonderful couple of trips! Good ol' Pete Clayton -- I wondered when someone would mention this famous "war" [Belize / Guatemala]. The last time it was brought back to my dark and distant memory was a few weeks ago at a "Cheese & Wine" bash. Whilst chatting to an ex Army type, who bragged consistently about everywhere he'd been and the conflicts he'd been involved in, I mentioned that the only "real" war I'd been involved in was the Belize war -- Great, he was stumped! Yes Pete, I remember it well -- We had "dug in" for a good 24 hours before the threatened day of attack, despatched 6 or 7 members of the S.A.S. to take up their strategic positions over the border ready to blow up Guatamala, and were ready for the impending dawn attack by the massed Guats. Then promptly at dawn one Harrier took off (yes, one! ), scared the beejeebers out of the brave enemy and the "war" was over! Of course it goes without saying that we were all heroes as far as the good people of Belize were concerned, we'd saved them from the horrible Guats. I seem to remember that the main cause of the confrontation was a tree that bears the juice used in the manufacture of chewing gum in the States. Belize had it and the Guats wanted it. You got it dead right about the T-shirt too. Oh happy days! I could write a book! Subject: How I spend my time! 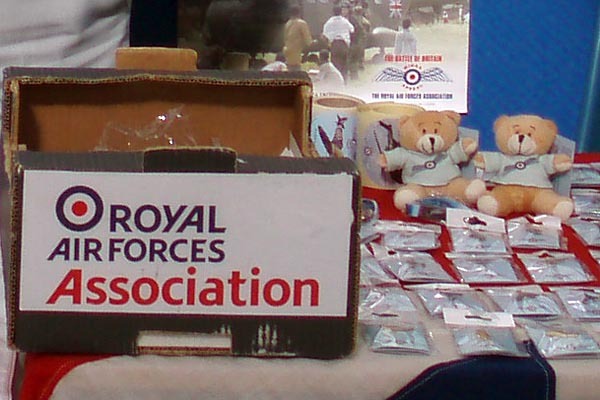 It seems the only thing I manage to do successfully is to raise funds for the Royal Air Forces Association Charity. 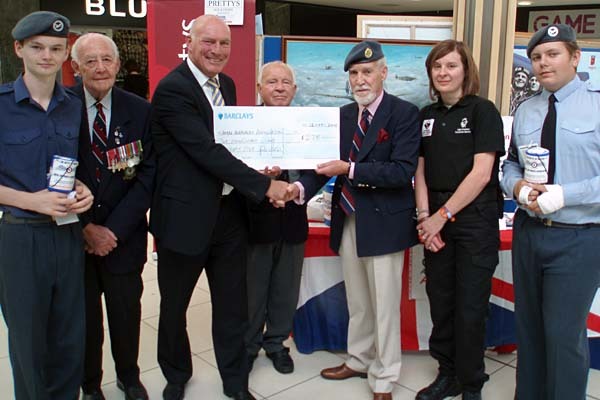 In the last issue you kindly published the Armed Forces Day Event which we staged in Chelmsford raising money, not only for our charity but also for the other Military Associations, the Royal British Legion, Help for Heroes and for the Soldiers, Sailors and Air Force Families Association. 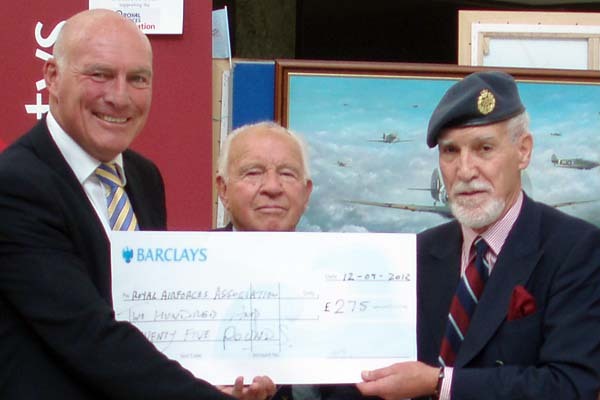 With September upon us, we celebrated “Battle of Britain Week” in Chelmsford. We commandeered the two Shopping Malls and the Supermarkets Morrison’s and Sainsbury’s, the Railway Station and numerous other sites and to date we have raised £9,659.31p. 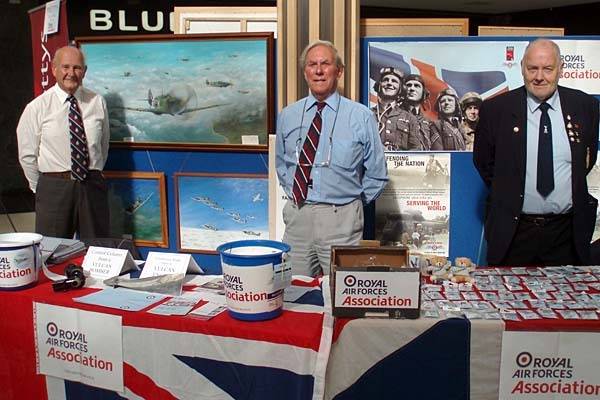 Our main thrust was the High Chelmer Shopping Centre where we displayed pictures and paintings commemorating the Battle of Britain and the 30th Anniversary of the Falklands Campaign. 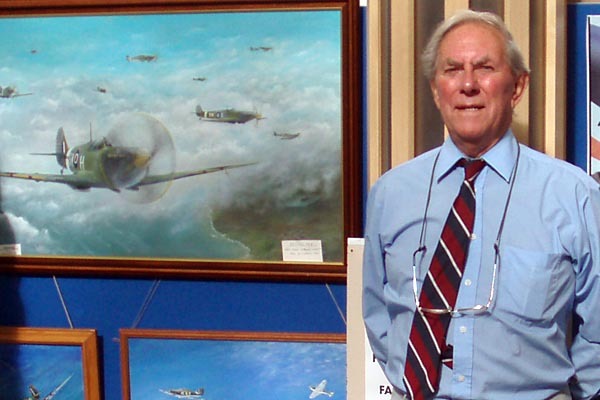 I’ve included photos of the event with our Aviation Artist Member, Tony Carey displaying some of his paintings – just look at that Spitfire!! 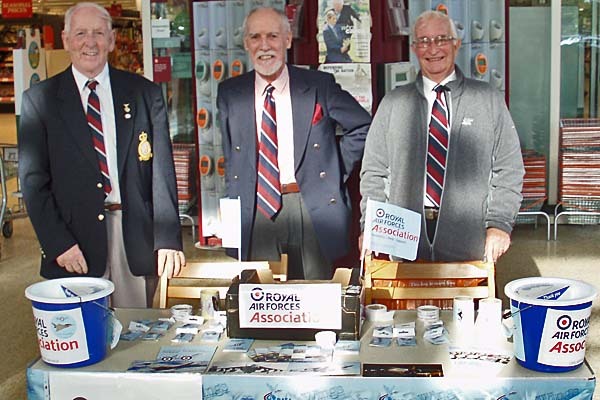 Many of you younger Movers will recall ex Lyneham AMO Flight Lieutenant Paul Stanford, our Treasurer. He did a spell at our site in the Meadows Shopping Centre which was located right outside Ann Summers shop. As he had mentioned to me that he had always wanted to have the excuse to visit such a place I persuaded the young ladies of the shop to invite him in for a private viewing of all their stock! They were ‘game girls’ but he wouldn’t say if he had accepted their offer!! Supported by a local firm of Solicitors “Prettys” they kindly handed over a cheque to me for a very acceptable £275. Collecting at Sainsbury’s I am flanked by our Chairman, Jim Machin and our Welfare Officer, Bryan Peaker. We will be out at Tesco’s Supermarket next week for a couple of days so with luck we should crack our £10K target for the year!